If you have a pregnant, nursing, or a hardworking dog, or a dog exposed to cold weather, these additional factors should be taken into consideration. Clean, fresh water needs to be available at all times. In gestating animals, feed up to 10% more than the recommended daily feeding amount to maintain body condition and in lactating animals, feed up to two times the recommended daily feeding amount. 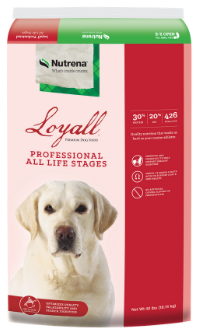 For puppies, you should feed up to 2 times the amounts shown. 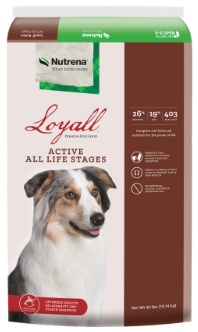 Loyall Professional Formula All Life Stages is formulated to meet the nutritional levels established by the AAFCO Dog Food Nutrient Profile for Growth and Reproduction. Chicken By-Product Meal, Brewers Rice, Whole Wheat, Chicken Fat (preserved with mixed tocopherols), Wheat Flour, Dried Plain Beet Pulp, Natural Chicken Flavor, Corn Gluten Meal, Ground Flax Seed, Menhaden Fishmeal, Dried Egg Product, Dicalcium Phosphate, Monocalcium Phosphate, Potassium Chloride, Salt, Calcium Propionate (a preservative), Brewers Dried Yeast, Glucosamine Hydrochloride, Vitamin A Supplement, Vitamin D3 Supplement, Vitamin E Supplement, Vitamin B12 Supplement, Niacin Supplement, Riboflavin Supplement, d-Calcium Pantothenate, Menadione Sodium Bisulfite Complex (source of Vitamin K activity), Pyridoxine Hydrochloride, Biotin, Folic Acid, Thiamine Mononitrate, Ferrous Sulfate, Zinc Sulfate, Copper Sulfate, Manganese Sulfate, Ethylenediamine Dihydroiodide, Sodium Selenite, Dried Bifidobacterium thermophilum Fermentation Product, Dried Enterococcus faecium Fermentation Product, Dried Lactobacillus acidophilus Fermentation Product, Dried Lactobacillus casei Fermentation Product.